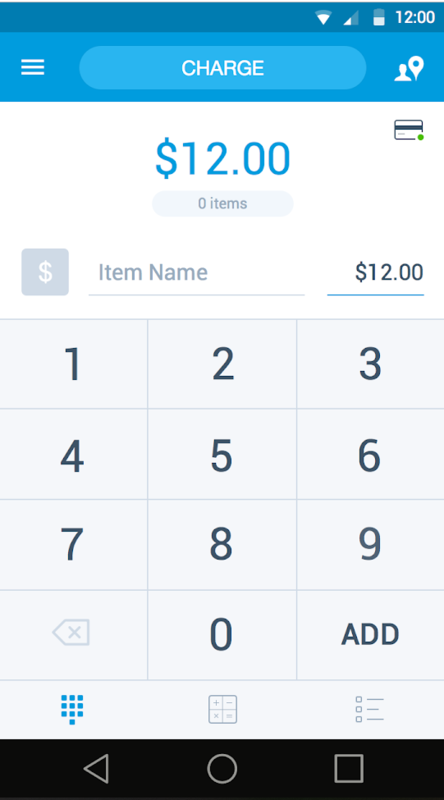 A credit card payment app allows businesses to process card payments using a mobile device. Stick to the free or low-cost card reader, and you’ll have lower upfront costs. Most all-in-one credit card payment apps have no monthly fee but charge a flat-rate fee per transaction. The best include point-of-sale (POS) tools in the same app. The two most important considerations of a credit card payment app are affordability and functionality, which is why we considered monthly, transaction, annual, and hidden fees for each. We also looked at the mobile POS (mPOS) features. They should have easy-to-use tools to help you manage your business. A credit card payment app is going to let you accept payments typically two ways: card-present and card-not-present transactions. All the companies on our list offer readers that accept one or more types of cards, and they include virtual terminals for card-not-present transactions. Square is our recommendation as the best credit card payment app for small businesses because of its low flat-rate fees, no monthly fee, and all that you get when you open a free Square account. The POS features give Square a huge value for the cost so that you can manage your business easily. Plus, Square is one of the most popular and renowned credit card payment apps on the market. Square remains the best credit card payment app because of its user-friendly interface, free account setup, no monthly fee, and easy-to-understand flat-rate processing fees, similar to PayPal. The app features are beneficial for startups and small retailers who want an all-in-one payment processor and POS. Square also integrates with other popular software. Square costs nothing to start so, in essence, this is free mobile credit card processing. Of course, nothing is truly free, so you’ll have to pay a flat-rate fee per transaction, which starts at 2.75% for in-person card transactions, which is slightly more expensive than PayPal Here and PayAnywhere. Square’s rate is pricier than traditional merchant services providers (MSPs) with interchange-plus pricing, however. The Square card reader for magstripe cards is free when you sign up for a free account. *The add-ons help to extend the usefulness of Square’s mobile payment processing app. The advanced card reader is great for businesses that anticipate most sales happening in person. Square Loyalty and its marketing add on can help you target current and new customers to offer them discounts, announce sales, and more. The payroll and employee management features might be needed when it’s more than just you running the business. For a better idea of how much you’d pay in transaction fees using Square, check out the chart below. It assumes you don’t subscribe to any add-on features. Square’s credit card payment app looks similar to many others when you get to the register screen. The menu and overall interface of Square are laid out intuitively, so you can get to the feature you need quickly, whether it’s inventory, customer management, or reports. Plus, Square’s app can be used on iOS or Android. Bonus feature: Square offers an offline feature that allows you to take credit cards without an internet connection. The payments will run when you’re able to connect again. The Square app register is simple and easy to read. Square’s app menu is intuitive, clear, and full of helpful features. Although the inventory in Square is basic, it could be all you need for your business. Add items, include the stock keeping unit (SKU), price, and apply variants, such as color, size, and so on, and then add your stock count. As you sell products, your inventory will reflect the change in stock. You can also note when stock is damaged or lost. As part of Square’s credit card payment app, you get free customer management. It’s a feature that allows you to save vital information about a customer, including name, contact information, and even a note section where you can list a customer’s likes, dislikes, or birthday, for example. Also, you can create groups for customers, such as “Loyal” or “Senior Citizen,” so you can treat your VIPs to discounts. Your Square app automatically collects data on your sales, inventory, customers, and payment methods. The reports you can generate can help you manage your business better, know when your busiest time for sales are, which products are top sellers, and you can forecast for future sales. You can view reports from the Square credit card payment app, or you can run reports from the web app and Square dashboard. 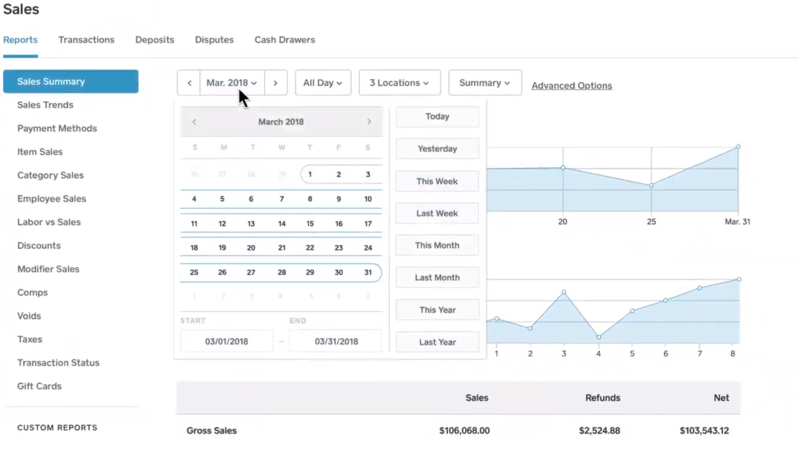 Square lets you run a variety of reports using the data you collect on sales, customers, inventory, employees, and more. 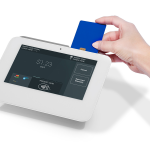 Square’s known for its little white square card reader, which comes free with any account. However, it only swipes magstripe cards, which isn’t the most secure method for transactions. You’d be better off buying the chip and tap card, which reads Europay, Mastercard and Visa (EMV) chip cards and accepts mobile payments, such as Apple Pay and Google Wallet, which is $49. Although Square offers many basic features that you’d need to run a business, the features aren’t fully fleshed out. For example, you can manage your inventory in Square’s app, but you can’t get ingredient-level inventory management, so it would be difficult to manage a full-service restaurant. To get a more comprehensive business management suite of tools, you have to add on features, integrate other apps, or upgrade to Square for Restaurants or Square for Retail. People who’ve left Square reviews write about the many features you get for free, the easy-to-use app, and brand recognition, which helps build trust with customers. The biggest complaint most customers of Square have is customer support, which can be difficult to contact at times, and representatives are sometimes less than helpful. Square’s credit card payment app lets you do more than process credit card payments with its included toolbox of business management features. Your account is free as is the app and the magstripe card reader. Get your free account today. PayPal Here is one of the best mobile credit card processing apps because it combines processing with POS features and no monthly fee. Plus, businesses can access funds paid to their PayPal accounts usually immediately. The advanced card reader accepts mobile payments, including PayPal app from your customers in person too. There are no setup or monthly fees to use PayPal Here, which makes it similar to Square. In fact, PayPal sends you a free magstripe card reader as well. Its in-person transaction fees are slightly lower than Square too, making it a more affordable choice. The rates start at 2.7 percent and go up from there. *Online rate/virtual terminal is only available with a PayPal Payments Pro account, which has a monthly fee of $30. The PayPal Here credit card payment app lets you sell items anywhere with your smartphone and the PayPal Here app for iOS or Android. You have a few options when it comes to card readers, but only the magstripe one is free. Like Square, you can manage inventory, employees, and run sales reports. PayPal Here’s credit card payment app has a simple interface to make it easy for anyone to ring up a sale from a mobile phone or tablet. You have several payment options when you use PayPal Here, including manual entry of a credit card and invoice. PayPal Here’s inventory management is basic compared to Shopify Lite and similar to Square’s. You can upload a list of products if you have a spreadsheet, and then attach photos to each item or service. Include descriptions, prices, and then place items in appropriate custom categories. PayPal Here’s payment app also lets you create variations on each item, such as small, medium, and large, all with different prices. The employee management options in PayPal Here are limited to setting up employee permissions for each user, so you can choose who can ring up a sale or issue a refund. You’re allowed to add up to 1,000 users. Through the PayPal Here credit card payment app or web app dashboard, you can run reports on sales, employee, or products, and you can view these reports by day, week, month, or year, much like in Square. You can also create a custom date range to view sales during a season or other time period. You can also see how your customers are paying for items, and which items are your top sellers. 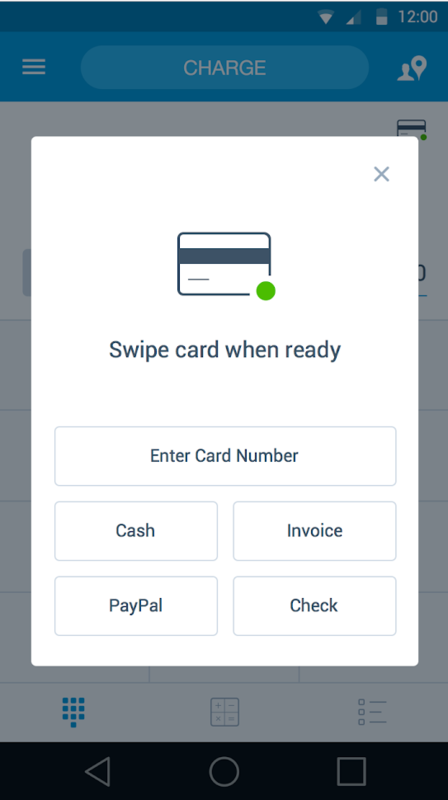 The mobile card reader that PayPal offers for free with the credit card payment app is swipe only, so you might want to pick up a more advanced reader. PayPal sells a chip-and-swipe reader for $24.99, and a chip and tap reader for $59.99. If you buy the chip and tap reader, you can accept contactless payments, including PayPal payments when a customer uses their PayPal app to pay. The chip and tap reader will allow you to accept PayPal payments from customers who use their PayPal app to pay. PayPal Here offers a more basic credit card payment app than Square, especially when it comes to the mPOS features. Inventory management is useful, but you can’t track low stock easily in PayPal Here. Plus, you have to have an internet connection to complete a credit card transaction, which could be a problem if you travel to sell in more rural areas. The PayPal Here reviews are full of comments on how the app is easy to use, and lots of users like that there are no setup or monthly fees. If anything, customers of PayPal Here get frustrated with funds being frozen, which is common with all-in-one payment processors because the companies set limits on transactions to prevent or flag potential fraud. PayPal Here is a good solution if you need a credit card payment app to accept credit cards in person, along with PayPal payments. There are no setup fees, no monthly fee, and you can get a free card reader in the mail. Sign up for PayPal today. Shopify offers a low-priced plan called Shopify Lite that comes with a credit card payment app, iOS- and Android-compatible card readers, and a Facebook ecommerce store. It’s an ideal solution for a retailer who’s just getting into the ecommerce and mobile selling scene. There is a monthly fee, but the transaction fees are competitive. Shopify Lite is the low-tier plan from Shopify, which costs $9 per month. There is no free account with Shopify like there is with Square and PayPal Here. The flat-rate fee, though, is similar, starting at 2.7 percent for in-person transactions. The monthly fee makes sense when you consider the mPOS and the ability to take payments on your website and Facebook, however. Shopify’s keyed-in rate is both lower and higher than the industry standard so that you may pay more or less, depending on your average transaction size. To make Shopify Lite work well for you, you’ll need to download two apps: Shopify and Shopify POS, the latter being the credit card payment app. From the Shopify app, you can add products, set up inventory tracking, manage staff, and run reports. The Shopify dashboard is well-designed and can be accessed through a mobile app or from the web. The mPOS for Shopify Lite is similar to many others with an easy-to-use register for ringing up a quick sale. 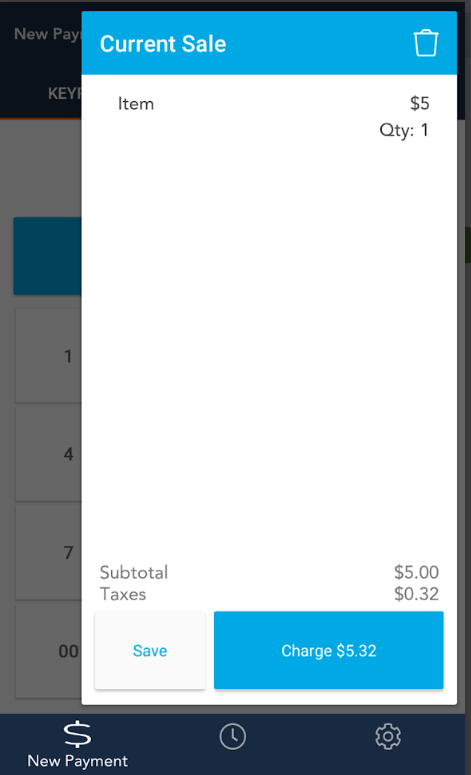 When you fill out your business information in the Shopify credit card payment app, tax information is applied to each sale automatically. 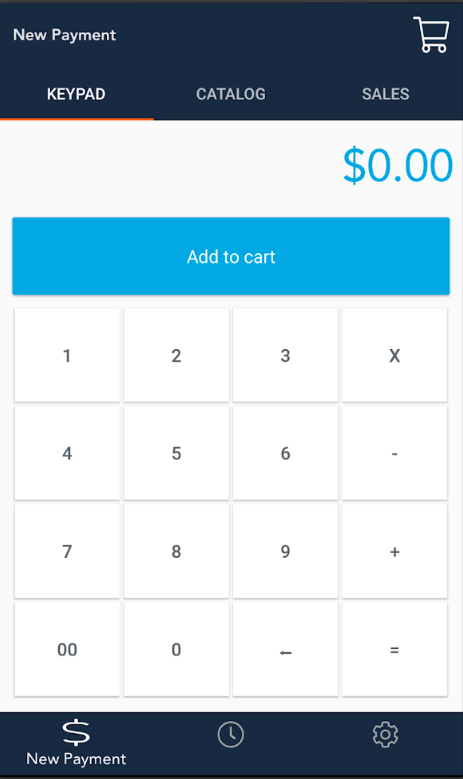 When you’re setting up Shopify Lite for your Facebook store and mPOS, you can do so through the dashboard, and it populates in your credit card payment app automatically. The sync is handy because you can track inventory easily, and you won’t oversell on products online or in person. Shopify Lite has one of the best inventory management systems for a mobile sales solution. As you add products to your inventory through the Shopify dashboard, either on the web or mobile app, your inventory in the mPOS is updated automatically. With the Shopify Lite plan, you only get one staff member to add to your account, so there isn’t any real employee management here like you get with Square. If you need to add an employee, you’ll have to upgrade to a higher tier, but that will also give you the option of adding a full online store. The analytics you can study in Shopify Lite are limited to an overview, live view, and finances reports. The overview dashboard gives you a good look at your total sales, social media store sales, total orders, and average order amount. The reports from Square and PayPal Here are surprisingly more helpful, given how Shopify Lite’s features are so robust. When you sign up for a Shopify Lite account, you’ll get a chip and swipe card reader for free, which is better than both Square and PayPal Here’s free option because it accepts magstripe and EMV chip cards. To process mobile payments using your Shopify Lite credit card payment app, you’ll need to purchase a tap, chip, and swipe reader, which costs $89 ― and could be on backorder ― or get a refurbished one from Shopify for $69. While Shopify Lite is a good choice for those who want to sell online and in person, it’s not a complete solution for a full business with multiple employees. You only get one staff account, and it’s best suited for retailers, not restaurateurs. Also, you can’t accept payments offline like you can with Square, which could be a problem if you find yourself selling in a spot with spotty internet or cell service. Overall, users who left Shopify Lite reviews are happy with the credit card payment app, and the dashboard. They’re both easy to use, they say, and many people mentioned the automated sync of online and in-person sales as a plus. 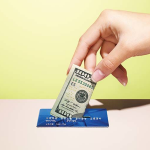 The only pain points seem to be the common ones of frustration at a lack of features, or when funds are frozen because of multiple chargebacks or large transactions. Shopify Lite can be a good option for those who want to sell in person and start selling online as long as they don’t mind being limited to a Facebook store. Shopify Lite offers a free 14-day trial. Sign up for yours today. Fattmerchant is a traditional MSP that offers a mobile credit card payment app as an option for on-the-go selling. Make sales in your store away from your counter POS, or on location at events. The affordable pricing structure works for retailers that process higher average transactions of $20 or more and higher monthly sales of $20,000 or more. Although Fattmerchant works more like a traditional MSP, it offers subscription-based plans. So, you’ll have a monthly fee of $99, if you process less than $500,000 annually ― $199 for $500,000 or more ― rather than a standard fee percentage on top of the interchange rate. The interchange-plus rate structure still applies in that you’ll pay the credit card companies’ fees, plus a cents-per-transaction fee to Fattmerchant. Whether you process a card in person, online, through an invoice, or manually key it in, the rate is interchange + 15 cents per transaction. *Includes assessment fee, which can vary based on card type and can change anytime; assuming Visa debit card for example (interchange rates vary for card type and card-present vs. card-not-present transactions. With a subscription to Fattmerchant, you’re getting more than a credit card payment app. You’re also getting the Fattmerchant-branded Omni platform, which gives you access via the web a dashboard where you can add products to your catalog, send invoices, analyze data, and store customer information. 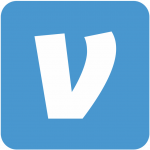 It syncs with the Fattmerchant app, too, much like Shopify. Ringing up a quick sale in the Fattmerchant credit card payment app is as simple and familiar as any other option. Taxes can be added to each item in your Fattmerchant catalog so that you don’t have to worry about tax additions during a sale. Fattmerchant calls its inventory a catalog, but it works similarly to Square, with a few exceptions. You can add items, include a description and photo, adjust the stock count, and set up low stock alerts. However, you cannot track by stock keeping unit (SKU) or bar code, and there isn’t an option for adding variants, so each small, medium, and large, or different colors of items, will have to be added separately. You can add them to custom categories, however. The employee management in Fattmerchant is light, but you can at least adjust roles and permissions for different staff members for levels of access. So, you can set up salespeople to only sell through the app and not issue refunds or void purchases. To get to your daily summary, sales trends, and other reports, you’ll need to log onto the Fattmerchant Omni web portal. You can run reports and see the busiest (or slowest) times of day, which can help you decide when to schedule employees. Also see how customers are paying ― credit, debit, invoice, and so on ― see stock counts, deposits, and more. The Fattmerchant dashboard shows you a daily summary of sales, along with averages, gross sales year-to-date (YTD), and more. When you sign up for Fattmerchant’s mobile plan, you’ll get to choose from two readers: a swipe and chip, or a swipe, chip, and tap mobile reader. Neither are free, but the prices are not published. A Fattmerchant sales rep estimated the less advanced reader costs about $79, which is more expensive than Square’s or PayPal Here’s most advanced options. If you want to use Fattmerchant for all your various sales channels, it’s important to understand that each one comes with a $99 or $199 monthly fee, making it an expensive choice for omnichannel sales. It’s also not the most feature-rich mPOS’ available. In Fattmerchant reviews, business owners seem to like the credit card payment app and the company itself for fee transparency and good customer support. Perhaps the biggest complaint, other than unapproved applications, is that the app and reader don’t always work. The good news is that Fattmerchant updates its mobile credit card processing app at least monthly to fix bugs. Fattmerchant is more traditional in its pricing structure than an all-in-one credit card payment app and service, but it can be a good choice if you’re making enough money to justify the monthly fee, and you process larger tickets, such as around $20 or more. Apply for an account today. Durango Merchant Services is a traditional MSP that offers a third-party credit card payment app you can use to process mobile payments. It’s specifically a good fit for high-risk merchants who may be denied accounts with other services. The cost is pricier than others on our list, but that’s always the case for high-risk industries. Pricing with Durango Merchant Services isn’t easy to estimate, as the company doesn’t disclose its rates. A good reason for this is that rates likely differ from merchant to merchant, based on sales volume, level of risk, credit rating, and more. If you need a high-risk merchant account because you operate a business, such as in the adult industry, a vape shop, or tech support, you should expect to pay around 3.5% to 10% or more on top of interchange-plus fees. Durango Merchant Services doesn’t stack up well against the more complete all-in-one mobile payment providers, but for a high-risk merchant, there are few options. The credit card payment app you download for your iOS or Android device can process swipe, chip, and tap mobile payments with one of many readers from Durango. Processing payments through the third-party credit card payment app Durango uses is as easy as ringing up a quick sale in other similar apps. Although this credit card payment app has fewer features, the interface is attractive and intuitive. Once you sign up for a merchant account with Durango, you’ll want to download the iProcess mobile credit card payment app to process payments with your smartphone or tablet. From this app, you can accept credit cards manually or with a reader, and you can view transaction history easily. The mobile payment app Durango partners with includes a customer vault, in which you can store customer data, such as name, contact info, and credit card information, which is secure in PCI-compliant data cloud storage. It’s a useful feature if you have recurring payments or regular customers who want to keep their information on file with you. The customer vault feature in this mobile payment app lets you add customer details for your regular clients. Durango offers a variety of card readers from some of the top names in credit card readers, including Ingenico, VeriFone, and the Z series of readers. Most of them include a keypad for PINs, touch screens for signatures, and will read magstripe, EMV chip cards, and contactless mobile payments, such as Apple Pay and Google Wallet. Durango Merchant Services does not offer its own mPOS so that you won’t get helpful features like inventory control, employee management, or data analytics. Instead, it relies on a third-party app, like Fattmerchant, for credit card payments. It’s also not clear about monthly or PCI-compliance fees. Many Durango Merchant Services reviews include testimonials from users who are happy they were approved ― high-risk merchants get turned down often ― and that customer support is friendly and helpful. The few negative reviews are mostly from merchants who were denied an account, which is bound to happen. Durango Merchant Services specializes in offering high-risk merchants accounts to process credit cards. The company also offers a mobile solution with a third-party payment app that focuses on processing credit card payments, rather than business management. To get started, visit the website and apply for an account today. 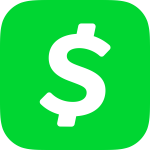 PayAnywhere is a credit card payment app and processor with one of the lowest flat-rate fees on the market. It’s a good choice for small retailers who need the best rate and want a simple mobile app for payments and need basic business management tools. The app and readers work for iOS and Android devices. It’s clear PayAnywhere’s biggest competitors are Square and PayPal Here, as they all have a similar pricing structure, but PayAnywhere attempts to go lower with its plans. There are two options you have: Pay-as-You-Go Plan or Standard Plan. If you choose to pay as you go, you’ll pay a flat-rate fee of 2.69% per transaction for in-person sales. On the other plan, the flat-rate fee starts at 1.69%, but it requires $10,000 to $30,000 in monthly processing, and it includes a $12.95 monthly fee. It’s worth noting that if your account goes inactive for more than 12 months, you will be charged a $3.99 inactivity fee per month. Also, if you choose the Standard Plan, there’s a less-than-$5,000 monthly volume fee of $79. PayAnywhere offers a good set of features with its credit card payment app. You can use a Bluetooth scanner or your phone’s camera to scan bar codes to add items to inventory or a customer’s sale. Plus, there’s employee management, reporting, and invoicing, in addition to mobile payment processing. PayAnywhere’s sale screen is similar to other credit card payment apps, but it offers more options and information on the screen. You can access helpful features within the PayAnywhere credit card payment app by clicking the hamburger icon. PayAnywhere’s inventory management is its best feature for the credit card payment app. Add items one by one, use a bulk inventory import option if you have a populated CSV file, or scan items with bar codes in using a Bluetooth scanner or your device’s built-in camera. Adjust item information, such as categories, variants, prices, stock count, and set up low-stock alerts. Just like Square and PayPal Here, you can create employee profiles and set user permissions in PayAnywhere. That’s where the management ends for the native software, but you can add paid integration with Homebase for a time clock and scheduling. The reporting feature in the credit card payment app for PayAnywhere isn’t as complete as what you’ll find in the provider’s web app, but it’s a good at-a-glance look at your daily summaries. 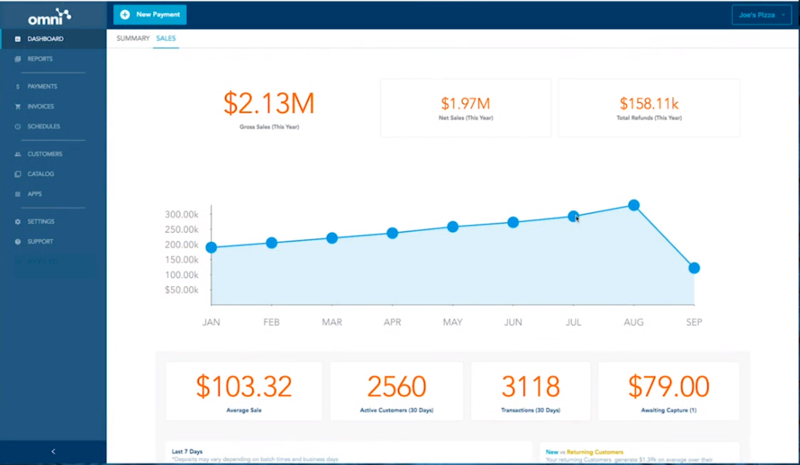 You can track sales, transactions, deposits, average ticket price, customers, and more. You can view a few different reports in the PayAnywhere credit card payment app, such as payment method, but there are more in the web app dashboard. Both of PayAnywhere’s mobile card readers are Bluetooth-enabled, making them suitable for use with many iOS and Android devices. The magstripe and EMV chip card reader is free with an account setup (each additional is $29.95), and the three-in-one reader includes contactless support so that you can accept mobile payments like Apple and Samsung Pay at $49.95 each. PayAnywhere seems like a robust mobile payment solution, but where you save money you could make up for in other fees, especially if you choose the Standard plan with its monthly fee and less-than-$5,000-per-month fee. There doesn’t seem to be room for high-risk merchants with this all-in-one payment processor, so PayAnywhere isn’t appealing to niche customers. For the most part, PayAnywhere reviews are skewed toward the negative side. There are plenty of complaints about the app not working properly, transactions not going through, and funds being held for inordinately long periods. Happier customers report the powerful feature set is easy to use, and more comprehensive than others, especially when it comes to inventory control. PayAnywhere is a good choice for a credit card payment app if you’re looking for the lowest flat-rate fee for in-person mobile transactions. The features in the app measure up to PayAnywhere’s top-rated competitors. To get started with PayAnywhere, go to the website and create your account. If you’re looking for the best way to pay a friend back for lunch, or you need to pay someone for a couch you found on Craigslist, then you can choose one of these peer-to-peer credit card payment apps. 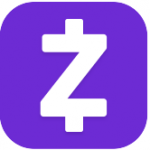 You can download one of these apps, connect a credit or debit card, or your bank account, and send or receive funds directly. The best credit card payment apps go beyond allowing you to process payments with a mobile device. They should include business management tools so that you can see your inventory, employees, and daily summary of sales from one spot. Square secures the top spot as best credit card processing for small business because it combines helpful features, secure and stable software and hardware, and an easy-to-use interface, whether you’re on an iPhone, Android smartphone, or tablet. It’s also free of any monthly or startup fees, and the flat-rate transaction fee means you’ll always know how much you’re paying every month. Get your free Square account.